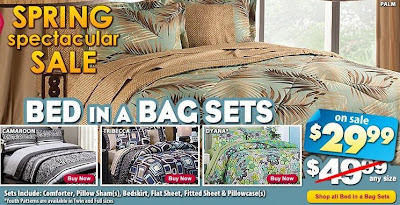 If you've been looking for a good deal on bedding sets, look no more! For a limited time, Anna's Linens has marked down ALL their Bed in a Bag Sets from $50 to $29.99. With a shipping charge of $7.50, you can get a complete set for just $37.50 shipped! Whether you need a twin or a king, you'll pay the same price! All sets include a comforter, pillow sham(s), bedskirt, flat sheet, fitted sheet and pillowcase(s). There are over 60 different sets to choose from. Click here to see them all!